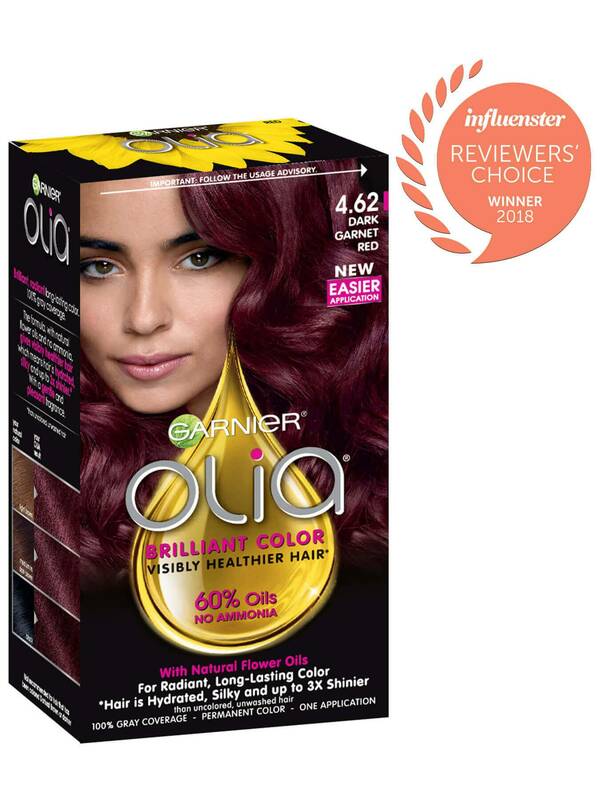 Garnier Olia shade 4.62, "Dark Garnet Red" was specially designed with patented high tenacity dyes that stay true to tone and resist fading for our longest lasting, deep red color result with a hint of burgundy reflects. It is best for anyone with natural hair between light brown and black. 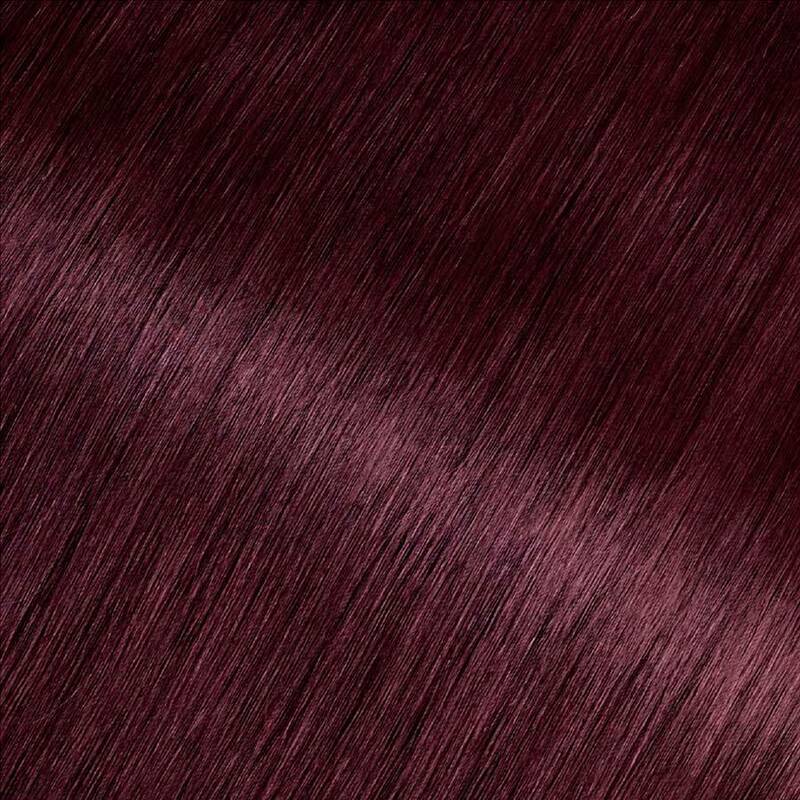 If you prefer a lighter shade that has similar reflects, try shade 5.60, "Medium Garnet Red." If you would like to remain in the dark brown range but would like to try other reflects and tones, there are many shades to choose from including 4.0, 4.03, 4.15, 4.3, 4.35, and 4.60. *For women with currently color treated hair, there are special considerations for the color result you can achieve. Because of this, we do not recommend shade 4.62 for hair that has been previously colored shade 3.0 "Darkest Brown," or darker. For more help, use our Shade Selector Tool to find the perfect shade for you! Rated 1 out of 5 by tachi from I used this dye a few years ago to refresh my red hair after it had faded. I wanted to go a deeper red for the cold months. I dyed my hair shortly before traveling to see my husband graduate from army basic training. The product itself felt very nice, and left me with a lovely burgundy color. I refrained from washing my hair for three days, as is usually recommended, and took a shower the night before my husband's ceremony. Using lukewarm water to protect the color, I washed with a sulfate free, red color protecting shampoo and conditioner, but all the color just washed right out. My hair was a burnt orange and patchy, with pink patches here and there. At my husband's ceremony I saw quite a few people doing the point and laugh, and I felt humiliated. When I got home I used a different brand of box dye to fix the color, and it didn't wash out at all. I think the oil in this product does something to the pigments and it just doesn't work with certain hair types or something. It ended up being a waste of money for me. Rated 5 out of 5 by LyssLove from Fabulous color - great results! First time dying my hair at home - was skeptical. The hair color turned out amazing! Sooo happy with the results - the conditioner left it so smooth and healthy looking. The color is warm and has depth to it- not just flat or boring. 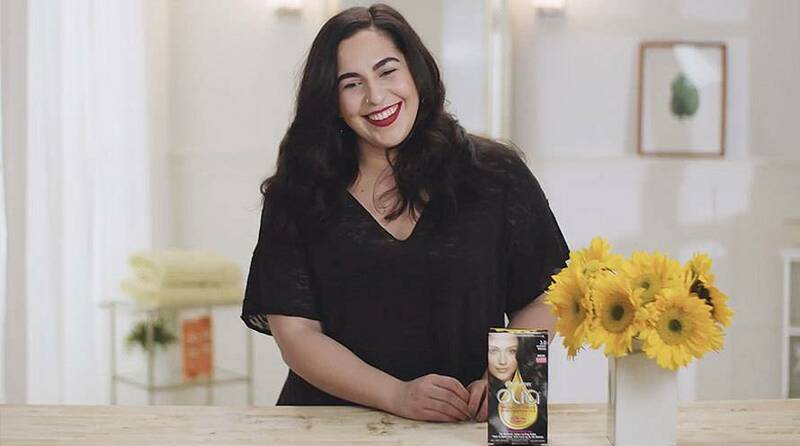 Goodbye salon visits - I’m sticking to Garnier Olia! Rated 5 out of 5 by ladyreiver from Great color I have used this color two times in a row. A month apart. It works great for hiding grey hair and gives a very fun color to my hair. I have had nothing but compliments. Thank you for coming out with this color. Oh! It also leaves my hair very soft. I love it. Rated 3 out of 5 by aygee423 from I thought this box dye was moderate. I used 2 boxes for a color that was really close to my natural color so all it really had to do was cover greys. And it most definitely wasn't my first time. But it's a good thing I'm not hair sensitive because the color was off. I dunno maybe it was old but I would not buy again. Rated 5 out of 5 by jazzyjthomas from I love this brand. I have been faithful to it for over a year now. The OLIA is my favorite and the 4.6 is my favorite bluetoned red shade. It’s so pretty on me and I’m faithful to it. I get compliments every time I dye my hair and it’s super hydrating. Rated 5 out of 5 by christelkellyxo from This is the ONLY hair dye I use for my hair. I have naturally curly, very fine hair that has become damaged and brittle from years of colouring and flat ironing. Garnier Olia hair dye is the only at-home hair colour that doesn't leave my hair feeling like straw afterwards. My hair looks and feels healthier and the colour always looks great! Rated 3 out of 5 by lizp2d3d from So I dye my hair all the time and I’ve been going for reds most of the time. I’ve used different brands to see my favorite and sadly, this brand is not. Granite has great products and I’d probably buy it again since it’s cheap and has good colors. It keeps my hair healthy as well. My problem with it is that it doesn’t stick to all of my hair and I have strands here and there that are not dyed, but I know I got it all. I’ve done it so many times and I have extra so I saturate my head so I know I get every piece. It just for some reason doesn’t stick and I wish it did.